300 George St was the old law courts site for Brisbane. With the relocation of the courts the site was purchased for development by the Shayher group. Existing building was over three main buildings over seven storeys. The new design was a seven level basement over entire site with Podium levels. Three major buildings including 80 storey residential building, 40 Storey commercial building and a 36 storey “W” branded 5 Star Hotel. The site contained a number of large existing structures over seven storeys and existing basements. Mainland undertook the demolition and subsequent civil works for the project. Demolition involved three main buildings in a conventional top down demolition. Structures were predominately reinforced concrete with panel façades. 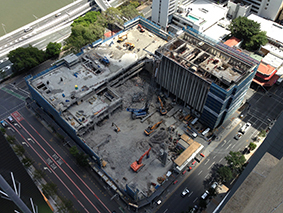 Civil works involved bulk excavation of 140,000m3 of material over an entire city block in the middle of Brisbane. Material removed was clay and rock with the majority being rock. The excavation was to a depth of 23meters below existing street level, which posed a number of issues with material movement out of the project. To enable excavation a retention system was installed using soldier piles, shotcrete walls and ground anchors. The 7600m2 shoring system was installed including over 1150 ground anchors. Bulk earthworks and retention system installed and excavated to completion 6 weeks ahead of schedule. Detailed excavation of three main lift cores and associated footings, services trenches main lift core for residential was over 6.5 metres below bulk excavation and involved blasting rock to form lift core. The project was delivered safely, ahead of time and on budget for the client to start building an iconic new development worth around $900 million.